Copper parts is a non-ferrous metal parts that is closely related to human beings, which is second only to aluminum in the consumption of nonferrous materials in China. 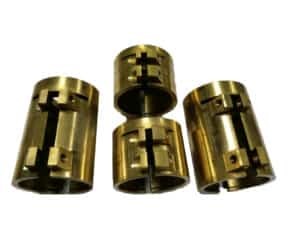 And for now, copper parts had been widely used in electric, light industry, machinery manufacturing, construction industry, chemical industry, defense industry and other fields. Of course, the different industries to the surface finishing of copper parts requirement is difference. Today, we will further to discuss Copper parts surface finishing of knowledge to you. In general, the copper can be divided into: Brass, bronze and copper. 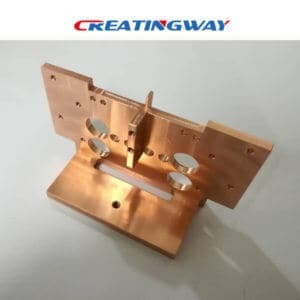 The surface of copper will be anodized to varying degree because of the environmental impact, thus the surface protection treatment is necessary to a new appearance and the performance of corrosion resistance. It is mainly to remove stains, impurities, spots, oil stains and other dirt from the copper surface thoroughly, and restore the bright and lustre of the copper. It is also the necessary process of copper passivation. The effects of passivation are prevented to be anti-anodized and anti-corrosion. Due to the copper is a reactive metal parts, it is easily to be anodized in wet or special environmental, even appear copper green phenomenon, so the passivation of the copper is the most necessary processes. It can be better to protect the copper surface. Using the copper parts as anode and electrolytic methods to form a thin anodizing layer on the surface. And the anodizing film can change the surface state and properties of the parts. Such as: surface shading, improving corrosion resistance, enhancing wear resistance and hardness, protecting the copper surface etc. Its purpose is to coat copper layer with metal coating to change the properties and dimension of the surface of the copper. Plating can enhance the corrosion resistance of copper, increase hardness, prevent wear and tear, improve conductivity, smoothness, heat resistance and surface appearance. When one cooper part was completed. We need to put it into copper chemical polishing liquid for soaking, thus make its rapid reach a new beautiful color and lustre of the parts. At the same time, rapid removal of the surface anodizing. Even so the surface will have a certain changes for the size of the parts, but it can be controlled effectively. After the chemical polishing, the cooper parts should be treated as soon as possible in case of reoxidation and discoloration. This is more information around copper parts surface finishing.